Smoke will continue to be a problem in may areas. The smoke may improve somewhat Friday and Saturday afternoons. High pressure continues over the west. 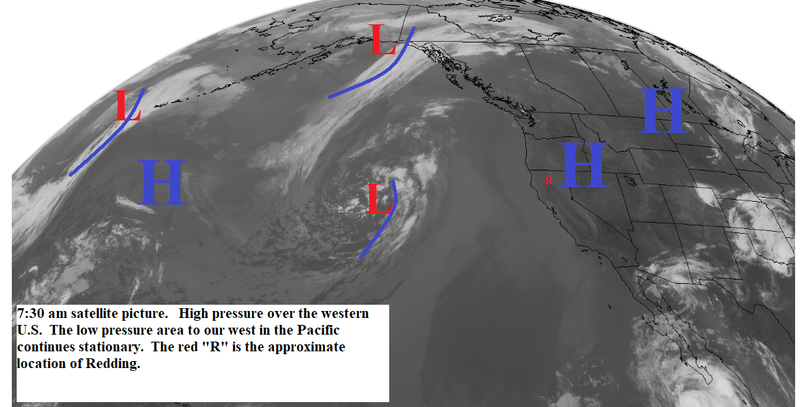 The low pressure area to our west over the Pacific continues stationary. The low will start moving northeastward later today and will pass through the Pacific Northwest and western Canada late Friday and Saturday (see map below). Temperatures today and Thursday will be about like yesterday or a little warmer. Friday through the weekend we will see few degrees of cooling. Light to moderate south winds are expect in the afternoon and evening today and Thursday with gusty southwest to northwest winds Friday. Next week we will be back under the high pressure ridge for above normal temperatures and relatively light winds. One thing to watch is moisture from one of the hurricane getting pulled northward late in the week.